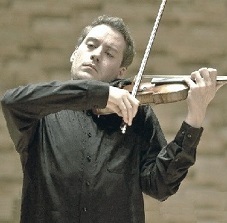 Kristof Barati is a Hungarian violinist and teacher born (in Budapest) on May 17, 1979. Although born in Hungary, he and his family spent a few years in Venezuela (for reasons unknown) and he even began violin lessons there with his mother at age 5. By age 8 he was giving concerts with orchestras in Venezuela. I don’t know at what point the family moved from Venezuela to Europe but several sources state he performed in France at age 11. Sometime after or before this, he relocated to Hungary to study at the well-known Franz Liszt Academy. Exactly what year that was is unknown to me. His teachers at the academy were Miklos Szenthelyi and Vilmos Tatrai. By 1995, at age 16, he began entering violin competitions at which he was very successful, placing either first, second, or third at all of them. In 1996, he began studying privately with a little-known professor of violin, Eduard Wulfson, in Paris. Music critics frequently praise his musicianship (artistry) in addition to his phenomenal technical prowess. In addition to his world-wide concertizing, he also takes part in important music festivals in Italy, France, Switzerland, and elsewhere as a chamber music player. Barati’s discography is not yet extensive, but his recordings of the first and second Paganini concertos are among the best. His recording of the Mozart concertos (all five) has also been very highly praised. Although he has played other very fine and valuable violins, for about 14 years (from 2003), he played (and recorded with) the Lady Harmsworth Stradivarius violin constructed in 1703. I don’t know if he is currently using that instrument. He is known for being a very strong chess player and avid photographer. Barati has taught at the Sorbonne in Paris and at other venues as a masterclass professor. Although he has not (as far as I know) performed all 24 Paganini Caprices at a single recital, he has performed all six Sonatas and Partitas for solo violin by Bach in one (very lengthy) recital (in France, then again in Russia.) Here is a link to the entire recording of the Mozart concertos, courtesy of Brilliant Classics recordings. Here is a YouTube video of a movement from the Bach Sonata number 1. Kristof Barati also has a pilot's license and loves to fly. Among famous violinists who were good chess players are Louis Persinger, David Oistrakh, Fritz Kreisler, Leonid Kogan, Mischa Elman, Toscha Seidel, and Yehudi Menuhin.